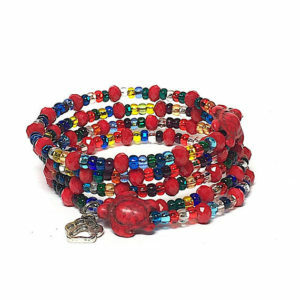 For people who like smaller beads, this bracelet called “Carousel” is for you. The red beads afford a feeling of happiness and energy. There are two turtle beads or perhaps tortoise beads as well. Both the turtle and the tortoise are considered good luck in some cultures. For the month of May, bracelet sales benefit Save the Pets AZ, a local Tucson 501c3 that has rescued more than 4,000 pets since their inception. You can read more about them on their website as well as here and here. All bracelets are handcrafted, one-of-a-kind, and come with a dangling paw charm. Bracelets cost $20, no tax. Save the Pets AZ receives $18 for every bracelet sold online. Postage is based on destination.